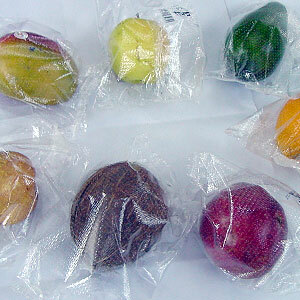 This kind of packaging is generally used for peaches, apples, pears, kiwis and tropical fruits. Flow Pack machines can also be used for the packaging of a single fruit. The Flow Pack can be feeded both manually or automatically using “scara” or “flexpicker” robots, in this case the line will be completely automatic. Usually, after arriving in boxes or bins, the unloaded (and often also pre-graded) product comes to a manual selection where waste fruits are separated from the others. Therafter we have the automatic packaging area where robots put the fruits on the Flow Pack machine.